So the other day I was venting a bit about how way too often things posing as "snacks" even though they have high saturated fat content. Sure this is an ice cream blog and I'm probably being too picky, but I'm tired and I'm cranky, and only some awesome treats can bring me back from the brink of going just a little too crazy. 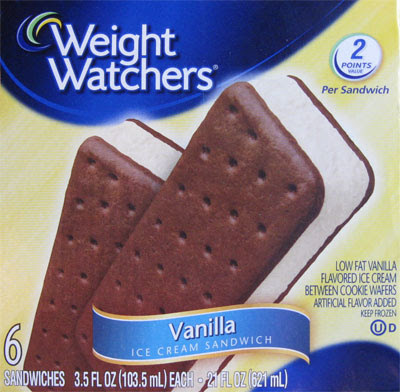 With this rash of blabbering in mind, I decided to put my money where my mouth is ...wait, money's pretty germy ...I decided to put my credit card where my mouth is and spied Weight Watchers Ice Cream sandwiches on sale this week. Usually a box of six is $5.29, but this week's price of $3.99 is a bit more tempting for my sampling needs. I'm not expecting much, but total fat and saturated fat clocks in at a very meager 3%, so how can I resist? The grocery store is less than a mile from work, but that was more than enough time for me to polish off my first sandwich. 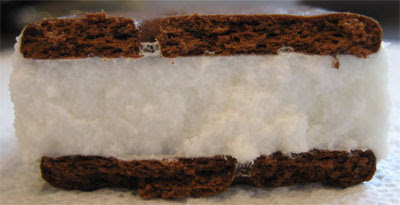 I unwrapped the very tidy looking ice cream sandwich with it's bright white filling and took my first bite. Not bad actually. The wafer to filling ratio is big enough to leave you will a somewhat traditional chocolaty wafer taste in your mouth. 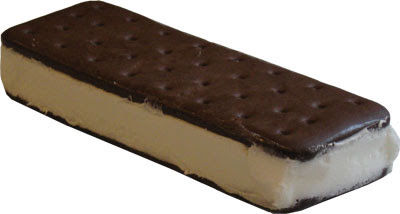 Ice cream sandwiches are a marriage of two great tastes, but in my mind, the wafer should be the more prevalent taste. Now that's some bright white filling! I just did a quick search and the general consensus is people like these treats, and I understand why, but the reviews always seem to gloss over the fact of how dry the wafers are. I'm not sure if you can see just how dry (and almost flaky) those wafers are in the picture. I got stuck a few times as I was eating, but still, it's not as sticky as I remember the Skinny Cow ones being, plus, these taste better. They don't really taste artificial or have some super funky aftertaste and both of those facts are always greatly appreciated. Final verdict: Not awesome, but at 3% fat, I could see squirming these little buggers into a new year's diet plan. I was actually going to have a second one, but decided that just seemed a bit wrong for a weight watchers product, though, that doesn't mean I can't have another one in a half hour or so. On Second Scoop: I managed to wait til the end of the afternoon and I had one more before I left for home. I'm going to say I like these little buggers for what they are, a low fat treat. The wafers are dry, but I can live with it. I guess the problem is, do you buy the regular ones that have triple the fat but a third of the cost, or do you buy these drier yet acceptable ones at triple the cost but a third of the fat? You decide, it's your diet! On Third Scoop: Let it melt a little bit, it will help disguise the dryness a bit!